At some point, every single one of us has reached a point of frustration. A situation where we knew that we were having impact that was far less than what we were capable of. Large organizations are filled with smart people who have great ideas. Unfortunately, most of these people find themselves stymied in their ability to bring people to their full potential and ideas to fruition. It doesn’t have to be that way. 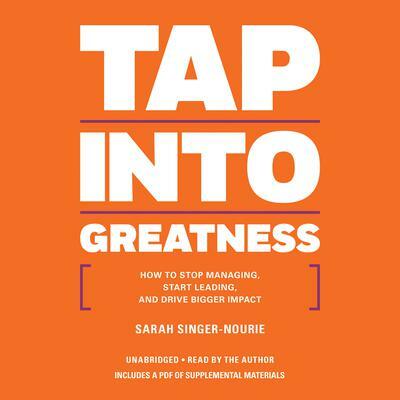 In Tap into Greatness, noted performance coach and educator Sarah Singer-Nourie reveals the key truths of having outsized impact, influence, and power. It turns out that most of us aren’t leading. We’re simply managing. We’re getting things done, but we’re not inspiring others to excel beyond what’s expected. Great leaders know better. They know leadership isn’t magic. It’s not just something you’re born with. Leadership is learnable. In this engaging and hands-on book, Singer-Nourie provides tools that have been developed over the last twenty years in her work with leaders and teams in corporate America, Silicon Valley startups, schools and non-profit organizations. The methodology is based on how people actually learn, rather than how most of us were taught in school. It leverages the insights of human motivation and the latest research in neuroscience to give leaders a road map for having impact. 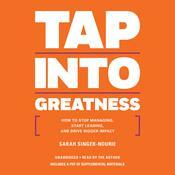 Listeners who put the tools of Tap into Greatness into practice have immediate and often surprising results. They find themselves able to influence colleagues who were previously unmoved. They’re able to inspire teammates to go above and beyond the call of duty. And they create teams that make better decisions even when the leader isn’t in the room. Sarah Singer-Nourie coaches leaders and teams in Fortune 500 corporations, start ups, school systems and community organizations. Over the last twenty years, her work has sparked breakthroughs for teams at some of America’s most dynamic companies, including Target, American Eagle Outfitters, Ulta, Limited Brands, and Bubba Gump Shrimp Co. Sarah is the coauthor of Disrupt Together and Quantum Teaching. She is the creator of the training programs Tapping Their Greatness, Pocket Full of Greatness and High Impact Training. Sarah has a Masters degree in educational leadership from Saint Xavier University and a BA from the Ohio State University. She is the founder of Sarah Singer & Co., and lives in Cincinnati, Ohio with her husband Colin and their three awesome kids.